Fortunately we have some cousins and friends who've had the cutest little babies imaginable in the past couple of years. Unfortunately we don't live close enough to any of them to see them very often womp womp. And so we've sent gifts to welcome the little kidlets into the world so that when they grow up they'll know that Auntie M and Uncle D wished they had been close enough to cuddle each of them on a regular basis! Aren't these abso-freaking-lutely adorable? We got one of these for a dear friend's baby some time ago. You know that kid was pretty much the coolest kid on the block whenever he wore the little onesie! So adorable! I am all over this if I ever have a child. 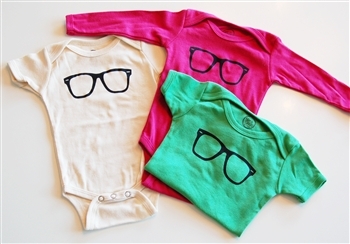 We LOVE this onesie that you sent Desmond-- and you're so right, he's the hippest kid on the block when he wears it. :-) awesome!! I hope we get to see you guys sometime soon!